Explorer-I, officially known as Satellite 1958 Alpha, was the first United States earth satellite and was sent aloft as part of the United States program for the International Geophysical Year 1957-1958. The satellite was launched from Cape Canaveral (Launch Complex 26) in Florida at 10:48 P.M. EST on 31 January 1958. The 30-pound, pencil-shaped satellite was placed into orbit by a four stage launch vehicle. 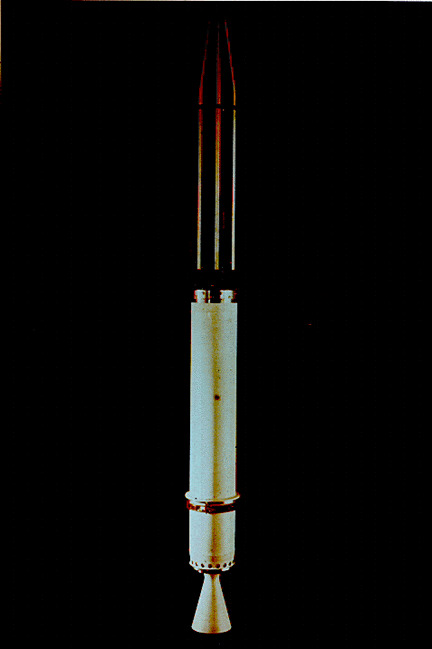 The first stage was a modified Redstone ballistic missile, called a Jupiter-C, while the upper three stages were solid-propellant rocket motors. Carrying a special Geiger counter designed & developed by Dr. James Van Allen (from the University of Iowa), the device discovered the belt of trapped radiation surrounding the earth, which was later named the Van Allen radiation belt. These cards were produced by the Air Force Space & Missile Museum at Cape Canaveral Air Station, Florida. 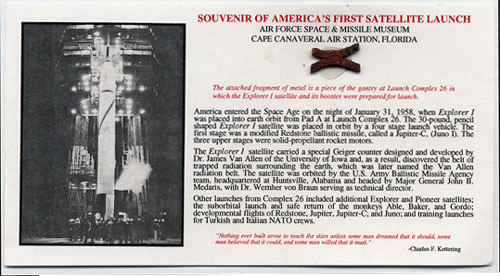 The small fragment of metal on the card is a piece of the gantry at Launch Complex 26 in which the Explorer I satellite at its booster were prepared for launch. 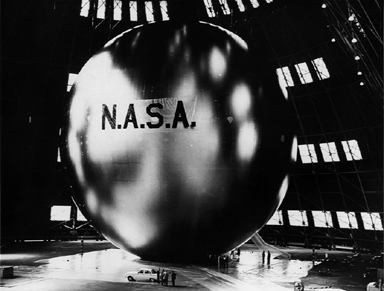 Echo, NASA's first communications satellite, was a passive spacecraft based on a balloon design created by an engineer at NASA's Langley Research Center. Made of Mylar, with vacuum-deposited molecular film of aluminum, the satellite measured 100 feet (30 meters) in diameter. Once in orbit, residual air inside the balloon expanded, and the balloon began its task of bouncing radio transmissions from one ground station, on Earth, back to another. The Echo 1 satellite generated a lot of interest because they could be seen with the naked eye from the ground as they passed overhead. They were launched into orbits that caused them to circle the earth about once every two hours at an altitude of about 1000 miles. They were visible from earth in the evenings and looked like fast moving stars. 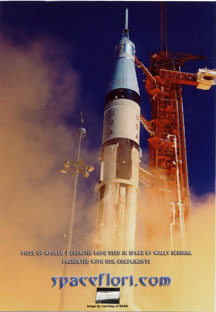 Echo One was launched on 12 August 1960 and remained in orbit for almost eight years (Echo I reentered on May 24, 1968). Echo Two was launched on 24 January 1964 and remained in orbit for about five years (reentered on June 7, 1969). Echo Two was the first instance where cooperation between the United States and the USSR in a space mission occurred and it relayed a signal from an observatory in Manchester, England to Zimenki Observatory near Gorky, Russia. The satellite made direct coast-to-coast television transmissions in the United States possible. The two samples are identical to the material used in the Echo Satelloon. Made by the Gilmore T. Schjeldahl Co. (later named "Sheldahl Inc.") in Minnesota, it was fabricated for NASA's Echo program. The material is a sandwich of Accoa ultra-thin aluminum .00018 inches thick on either side of Dupont Mylar polyester film .00035 inches thick. 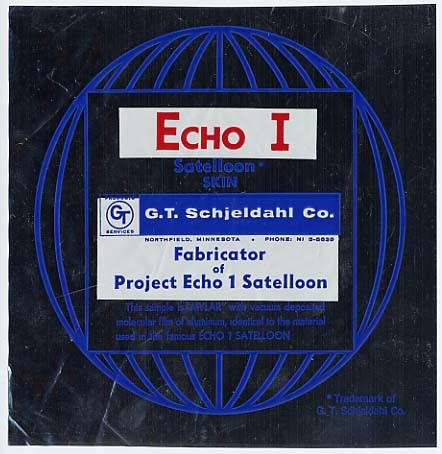 Included is a sample from the first Echo and material from Echo II which was a improved version, with black ink of it's reverse to help equalize the temperature of the satelloon's sphere. The material called "Schjelbond" was developed as an adhesive to hold together the Echo. It should be noted that the Echo Program was commemorated with its own 4-cent postage stamp. Postmaster General Arthur E. Summerfield on November 10, 1960, announced the plan to issue the stamp on December 15, 1960, in Washington, D.C.
"Commemorating the 40th Anniversary of Americans in orbit, this medallion contains metal from Mercury Atlas launch pad 14 -Glenn-Carpenter-Schirra-Cooper"
Production of the medallion was sponsored by Space Adventures, Ltd., the company responsible for space tourists Dennis Tito's and Mark Shuttleworth's flights to the International Space Station. Apollo 7 was the first manned flight of the Apollo spacecraft. The primary objectives for the Apollo 7 engineering test flight, were simple: "Demonstrate Command/Service Module (CSM) and crew performance; demonstrate crew/space vehicle and mission support facilities performance during a manned Command/Service Module mission; demonstrate Command/Service Module rendezvous capability." For nearly 11 days, the Command Module was run through numerous tests. Almost without exception, spacecraft systems operated as intended. The Command Module's service propulsion system, which would fire the Command Module into and out of Moon orbit, worked perfectly during eight burns lasting from half a second to 67.6 seconds. The mission lasted 163 orbits with the crew being the first to beam live telecasts from orbit, and giving millions of people worldwide their first view of space. The inspiration for this medallion was conceived by Dr. Preston T. Farish, director of the Manned Flight Awareness office at the Marshall Space Flight Center in Huntsville, Alabama. Along with NASA Astronaut Frank Borman, Dr. Farnish oversaw the development of the artwork which was prepared by the Graphics Art Dept., also at the Marshall Space Flight Center. On the flight of Apollo 8, Commander Frank Borman carried a half-inch diameter sphere of aluminum (type 2219) alloy in his "Personal Preference Kit" along with other personal item he wished to take with him. This particular alloy was chosen because in represented many of parts used in many of the critical structural parts of the Saturn V rocket. After the mission, the sphere was returned to the Marshall Space Flight Center. For fear of loss, the sphere of Lunar-flown metal was cut in half. One of the pieces remained safely in Huntsville, while the other was flown to the Alcoa plant in D avenport, Iowa. Under the watchful eyes of NASA and Boeing representatives, it was added in a smelting furnace to a molten batch of aluminum (type 1100) alloy. The ingots products were then transported to the Barco Mint of New Orleans. At the mint, a total of 200,000 medallions were struck and packaged in bags of 500 each. All left-over scraps from the minting process were certified as 'destroyed' by John Barr, the president of Barco Mint on June 30th, 1969. The medallions were then shipped to the Boeing Company in Huntsville (who were responsible for most of the subcontracting arrangements). From there they were distributed to the principal Saturn contractors and NASA agencies which had anticipated in the Apollo program. These medallions containing flown metal are now commonly referred to as the "Manned Flight Awareness Medallions" (or "Space Flight Awareness Medallions" for more recent productions). Among the numerous companies receiving the medallions for distribution were: Boeing, Chrysler, Mason-Rust, IBM, North American Rockwell, General Electric, McDonnell Douglas, Bendix, RCA, AVCO, Grumman and ILC Industries. Eligible employees at Marshall, Kennedy, the Mississippi Test Facility, Michoud Assembly Facility and the Manned Spacecraft Center (now the Johnson Space Center) received medallions as well. Additionally, each of the Apollo 8 crewmen received 100+ for personal presentation, and fifty medallions were distributed to special personnel at NASA Headquarters, located in Washington DC. 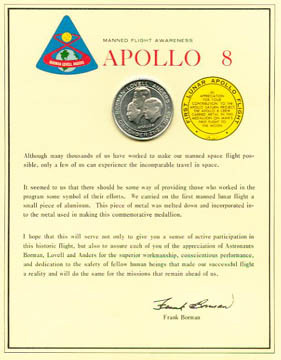 The observe of the medallion features the profile busts of Frank Borman, Jim Lovell and Bill Anders with the inscription "Apollo 8" centered underneath. Around the circumference is the inscription "Borman * Lovell * Anders - December 21-27 1968". The reverse carries the statment of authenticity written in the text "In appreciation for you contribution to the Apollo Saturn project. The Apollo 8 crew carried metal in this medallion on man's first flight to the Moon".